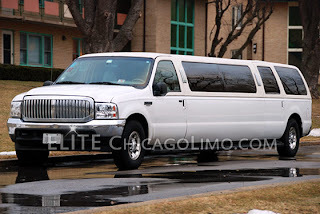 Limo Service Chicago: What's So Cool About SUV Stretch Limos? Chicago is home for numerous limo service Chicago companies. Many offers SUV stretch limo services. But you may be thinking " What's the difference between a regular stretch limo and a stretch SUV?" Well, SUV's are big and spacious, they can comfortably accommodate up to 18 passengers. Some SUVs have seats on both sides of the car, some have big bars and seas inside. The main thing, however, it that there are numerous possibilities for interior designer with a stretch SUV. It is much bigger than a regular stretch sedan and there is more room to work with. So Elite limo service Chicago used those advantages, added some creativity and partially rebuilt some of the vehicles! 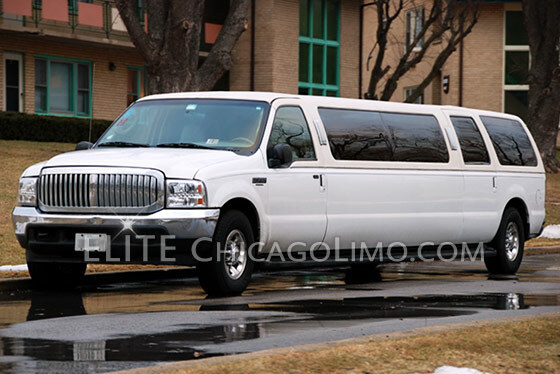 Just take a look at our Ford Excursion SUV Chicago Limousine. It accommodates 14 passengers comfortably and with added lasers, disco ceilings, hardwood floors and rebuilt seats it is easily the hottest party car in Chicago! Moreover, it has a QVM license and can take you to any corner of Chicago! Don't get fooled by other limo companies offering cheap prices with unlicensed cars, choose Elite and be Elite!